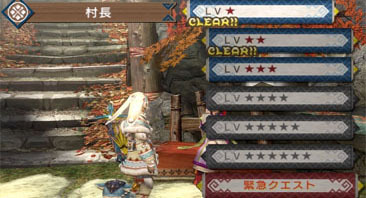 Visual help in Monster Hunter Portable 3rd - Pioneer Project - Enjoying video games a little differently. Deciding to play a game completely in Japanese is not a decision I take lightly. In fact it’s a decision I’d rather not make at all. More often than not I (and many others like me) find ourselves importing a game simply to experience a game that doesn’t have much hope of making it to our region. I imported Monster Hunter Portable 3rd (and it’s HD equivalent on PS3) at the beginning of this year for just this reason. This was at the peak of a frustrating drought of Western Monster Hunter releases, so the decision turned out to be a favourable one. Despite the frustration of the release though, if you’ve played a Monster Hunter before, you’ll be right at home, and that’s because of how carefully designed Capcoms seemingly busy interfaces are. Strangely this isn’t something I really noticed until I could no longer read the words – a great litmus test of gameplay usability. There are many reasons why this most recent title has yet to reach anyone in the West. The most prominent being the lack of true online support for Monster Hunter Portable 3rd. 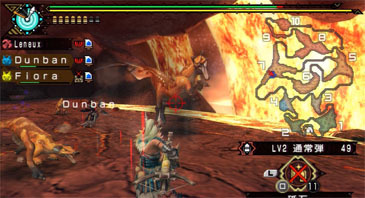 Many Japanese gamers still prefer to play Monster Hunter’s multiplayer in it’s original format, using cooperative play in person rather than online. Since I am unable to play online at this current time, returning to Monster Hunter Portable 3rd every week or so (in another language to boot) is an ongoing gaming project (and another example of good old fashioned local cooperative gaming). While I’m aware of the fan-made project to play the game in English. My Monster Hunter partner and I decided from the get-go to play the game as intended. I am surprised at how competently we are able to manage playing Monster Hunter in another language. This isn’t mere familiarity with the series, Capcom employs some very smart game design principles to make what can be an obtuse game very understandable by a foreigner. The organisation of hunting quests by rank/difficulty has been present since the first game, but Portable 3rd improves this, by shading the whole quest element the appropriate colour. Generic quests in blue, and urgent quests in red, Gathering in green etc. The combination of ranked star system and numbers used to denote higher level quests becomes particularly helpful when you understand no Japanese. Where the game really comes into its own though is its use of colour. The game is great at using colour to denote positive and negative effects. You can work out from skimming the quest list a) where the quest takes place b) how many monsters you’ll be fighting and c) what the rewards are for that mission. This great use of colour works all the way through the game, from the good/bad status effect icons, the skill effects on armour right the way through to showing which items are returnable supply items in yellow. Overall Monster Hunter Portable 3rd continues this theme of visual accessibility by not changing the fundamentals of the series more improving the established elements that work, such as the menu and ability to skip between rooms. It’s very easy to commit to memory what all the functions of the menu do. In battle, I find myself flicking between my combine menu and quest info easily. 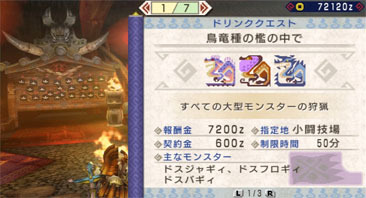 From the in-game battle menu I find I am using the iconography for the items used, far more than I did in the English versions of Monster Hunter. In the heat of the moment I search for the right icon I need first, then double check the Japanese secondarily to make sure that I have the right item. Capcom reuses colours and identifiable icons here to (usually) help distinguish one item from another). As a bowgunner, ammo is the only area where I find I have had to learn some Japanese. Each non-elemental ammo type has three different grades, so occasionally I find I can muddle up pierce and normal ammo when I am reloading. In fact ammo is the only occasion where this careful colour scheming can fall down – colours are reused not just once but more, the worse example is the use of red ammo being used for fire, tranq, dragon and demon shot. 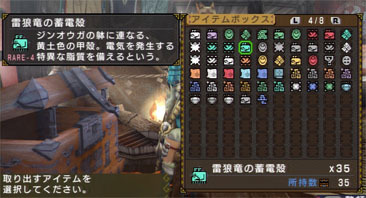 Gathering items and collecting monster parts however is helped by the colour schemes – despite the fact that they are reused as with ammo. All the large monsters you hunt have their own unique shading of the item parts, this together with the monster item icons makes it easy to tell a Tigrex claw from a Rathian webbing. These colour schemes are used for every item, from bombs, to insects. Making the process of collecting and finding the appropriate item easy to do. Visuals aren’t the only way that the game supports familiarity though. There are careful audio moments where (such as the song sung when meat is cooked correctly) and the icon prompts from your felyne companions that do transcend the language barrier. The rare moments where some English does creep in is appreciated. This ranges from the reloading messages on bowgun ammo, to success messages such as “quest clear” and “hunter rank up” notifications. I suspect the decision to put these particularly important statements into English was a way to make them stand out. As someone who doesn’t understand any Japanese, they are a welcome reward to my hunting. Audio cues continue to be useful through battles and general play. Success cues help support the messages I cannot always read, such as telling me when a monster has spotted me (by the battle music starting up) or when my supplies have arrived, or my supporting items worn off. This is most evident during something like combining items – particularly in the heat of battle. The audio cue quickly tells me which items have been successfully created, and how many failed without having to look at the item(s) in detail, this often saves precious seconds when things aren’t going as well as I’d like. Above all though, this is a game that has been made possible by a Western audience by the ever-impressive Monster Hunter community. Fans have translated the game into English for those who wish to do so using custom firmware. Most importantly for me though have have created a series of online resources which have been able to help me get started. From everything to explaining new tutorial and drink quests that are new to this Monster Hunter entry, all the way through to weapons upgrades and armour creation. 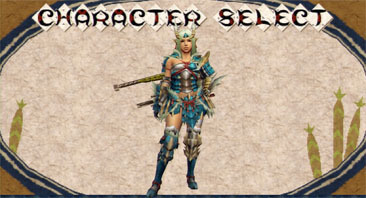 Weapons and armour creation are one of the few areas of the game that are trickier in Japanese. In this iteration of the game I have to plan out what I wish to create and build things far less on a whim. As enlightening and enjoyable as this Japanese playthrough of the game has been, it has fallen to the fans of the series once again to expand the intended audience. 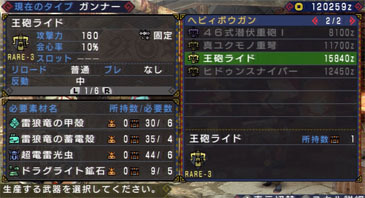 Capcom’s usability improvements in this iteration of Monster Hunter shows that is an evidently very playable despite a lack of Western release. I only hope that this Monster Hunter drought finishes soon. I have a new-found appreciation of the localisation process. I, too, was pleased with the relative ease of playing Portable 3rd in Japanese. Considering how many complicated systems and menus are in it, I was hesitant to import it at all initially. But a friend and I made a pact to learn it together and it went quite well, even eventually taking down that jellyfish dragon final boss (the name escapes me). About 3/4 of the way through, we eventually switched to using translation patches made by the community (mostly because of the equipment crafting), but overall things went well. I imagine, though, that if I wasn’t already very familiar with Monster Hunter it probably would have been a nightmare. One thing I think that the Japanese are very good at in design is layering information, so even by just glancing over a page in a magazine or a screen in game one can get a lot of information from visual & audio cues without reading a word. Not that every Japanese game is great at this, but it is something monster hunter is very good at! Having fairly consistent schema of items across the games is pretty helpful too, but, yeah, I wish they’d at least use different shades of red on those dragon, tranq, and fire bullets! Neat article, and nice writing across the site in general. I look forward to checking out more later!